Looking for mango sticky rice in Bangkok? You can find this iconic Thai dessert in many restaurants and street food stalls, but only a few places know how to elevate the dish to the next level. 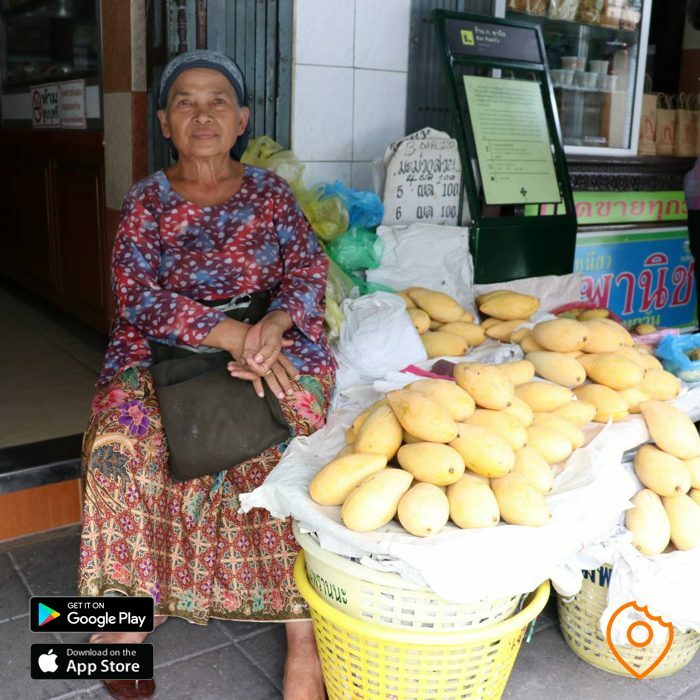 After a lot of testing and gaining a few kilograms, we came up with this list of legendary mango sticky rice sellers in Bangkok. ?All of these vendors sell the sweet Nam Dok Mai mango, and some also sell the sweet and sour Okrong, which is more of a green colour. The mangos are juiciest and sweetest during Thailand’s mango season (April and June) but don’t worry, you can eat them all year long. 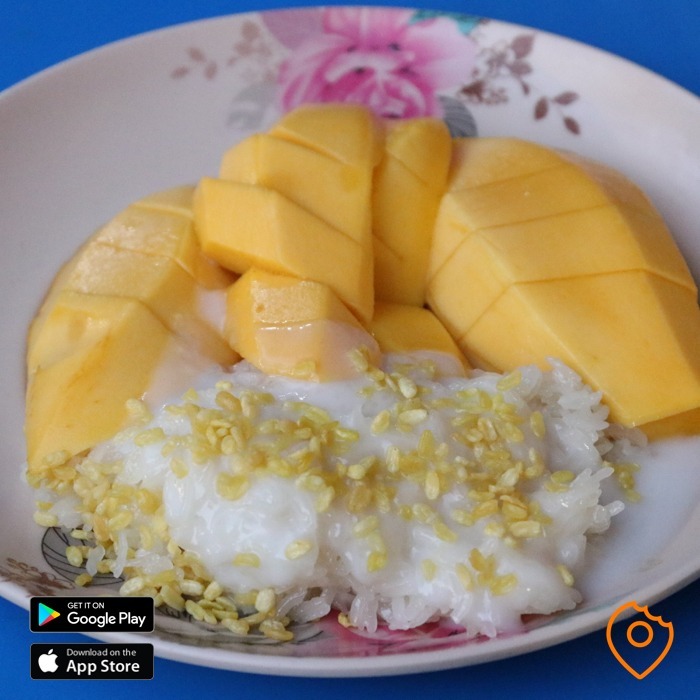 So, get your mango sticky rice in Bangkok at one of the sellers listed below, pour sweet coconut milk and crispy mung beans on top and devour this sweet, tasty dessert.? 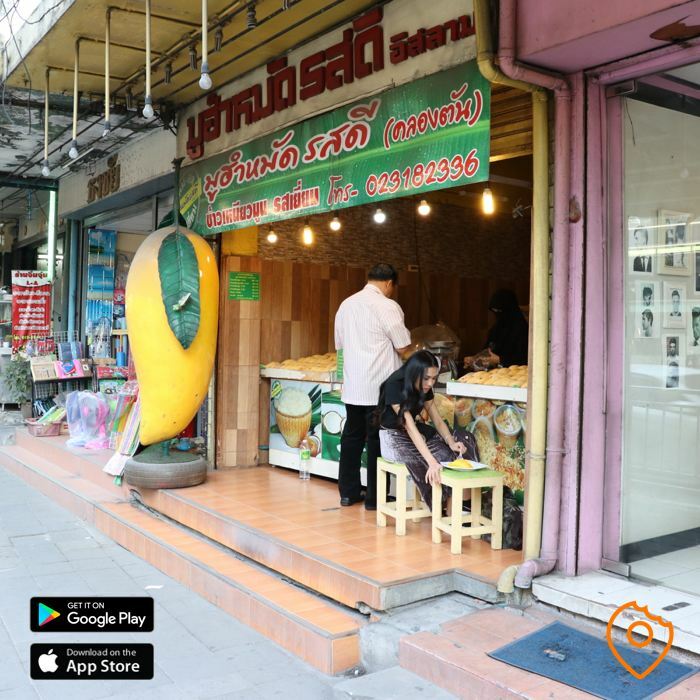 Established in 1947, this legendary dessert shop offers a variety of Thai sweets but their mango sticky rice is the most famous. 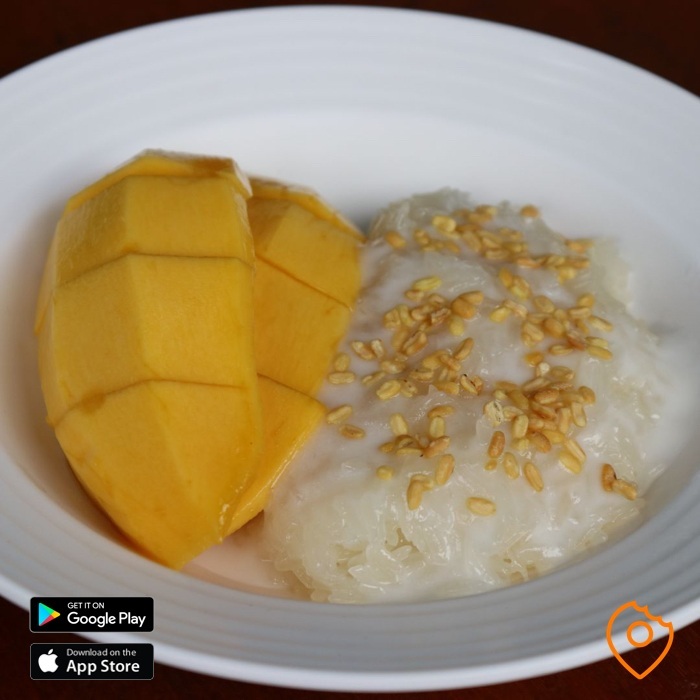 With their Royal Kitchen recipe and quality ingredients imported from all over the country, Kor Panich takes Mango Sticky Rice in Bangkok to the next level. 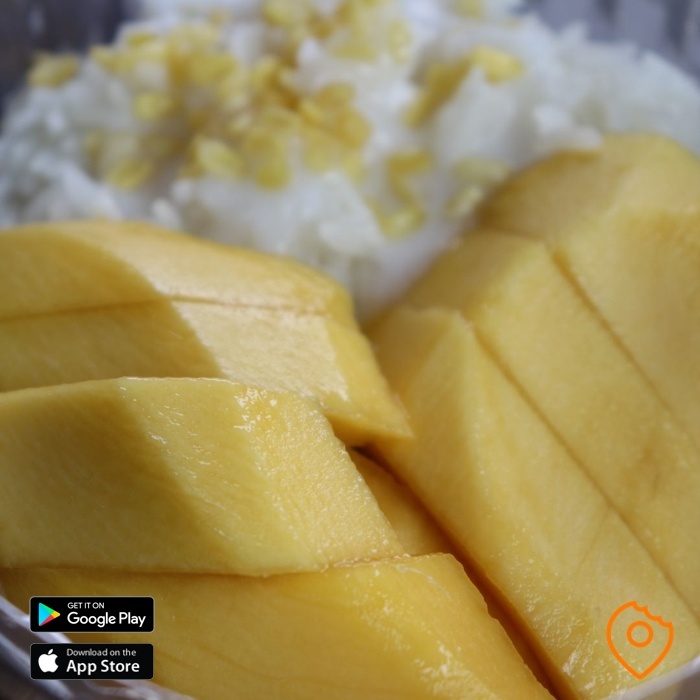 The mangos are sweet and juicy and their Chiang Rai sticky rice has a perfect, soft texture, yet keeps its shape. The mango sticky rice at Kor Panich costs 100 THB and they also serve sticky rice with sweet Thai custard and the unusual dried fish with sugar version (both 50 THB). Note: Kor Panich also has a shop on 250/5 Samsen Road, which is run by the owner’s daughter. 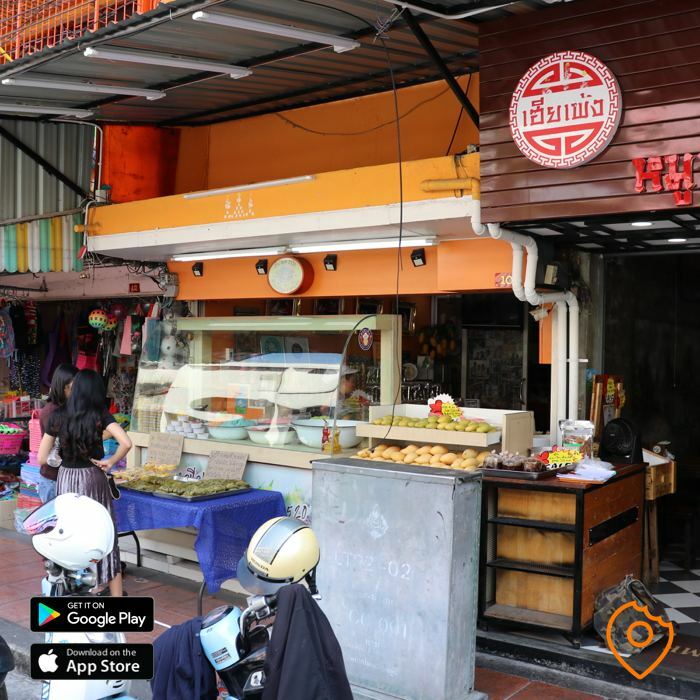 Boonsap Thai Desserts is located on Charoen Krung Road, a street with lots of other famous eateries, and serves excellent mango sticky rice in Bangkok. 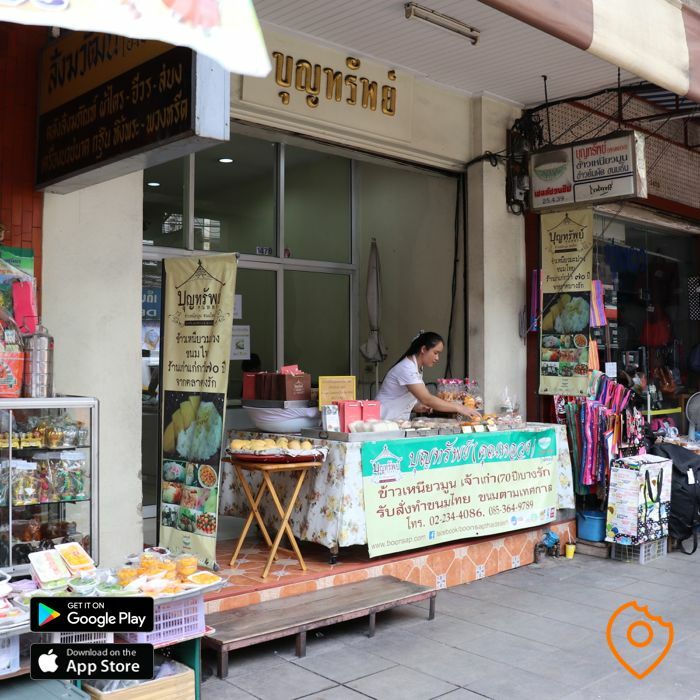 Similar to Kor Panich, Boonsap opened in the1940’s and has honed its Thai desserts and mango sticky rice recipes to perfection. Boonsap’s thickened coconut milk is the best in town and the Chiang Rai sticky rice, mangos and crispy mung beans are top quality. Expect premium ingredients from the best sources throughout the country. 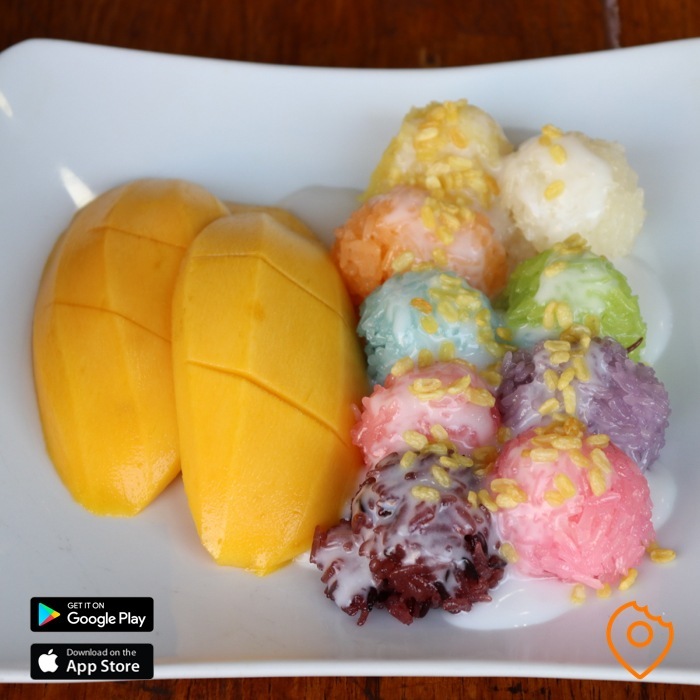 If the large portion of mango sticky rice isn’t enough for you, try some of their other Thai candies and desserts. Boonsap only offers takeaway (70 THB). Surprisingly, Muhammad Roddee (meaning “Tastes Good” in Thai) has stayed under the radar as a reputable mango sticky rice shop in Bangkok, until now. Of all the mango sticky rice in Bangkok we’ve tried, the quality at Muhammad Roddee was the best. The sticky rice was soft but kept its shape and had a perfect balance of sweet and salty flavours. Add one of their juicy mangoes and their creamy coconut milk and you have one tasty, carb-rich dessert! Muhammad Roddee only offers takeaway (90 THB). Sukhumvit Soi 38 used to be a large street food market but due to the construction of a new high-rise condo, the night market shrank dramatically. 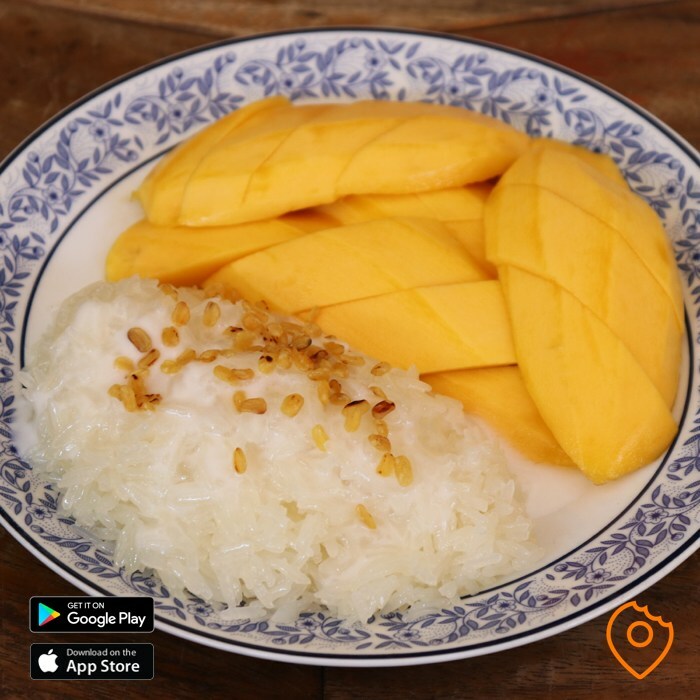 Luckily, famous Je Meaw stayed open and continues to serve delicious mango sticky rice. Expect generous portions, which you won’t find cheaper around the trendy Thonglor area (prices start at 80 THB). The sweet sticky rice is served with lots of salty coconut cream and crispy mung beans and has an excellent overall taste. 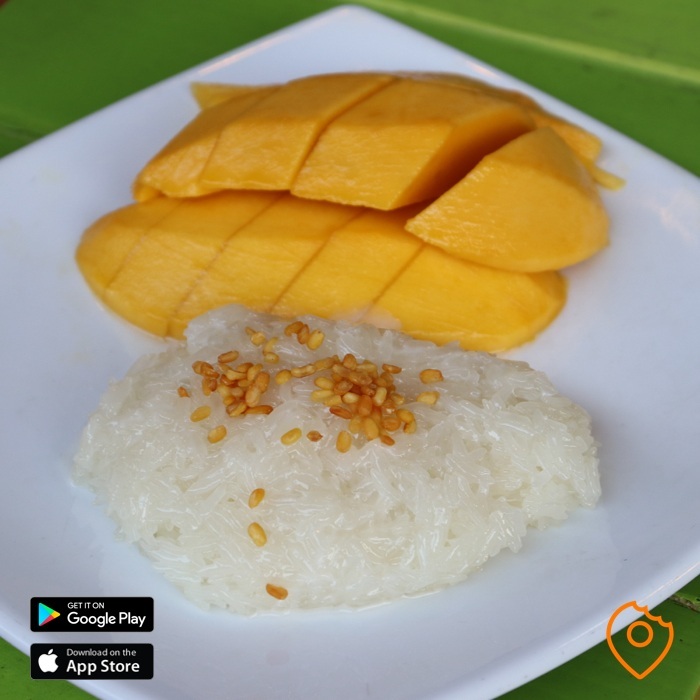 The mangoes are juicy and sweet, making the dish a contender for best mango sticky rice in Bangkok. Yod Thong, which means ‘Golden Leaf’, has been selling Chiang Rai sticky rice with pandan leaves since 1978. The pandan leaves give the sticky rice a pleasant flavour and the coconut cream at Yod Thong is of the highest quality, with no water added during the cooking process. 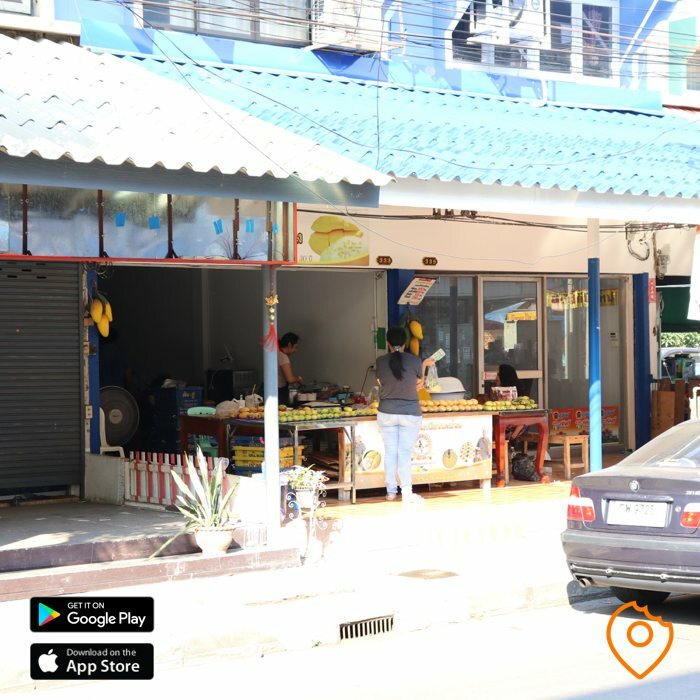 You can choose from different sweet Nam Dok Mai mangos, which are imported from important mango regions near the capital, Bang Khla and Damnoen Saduak. If you like pandan-flavoured desserts, then don’t miss Yod Thong. The restaurant only serves takeaway (75 THB). 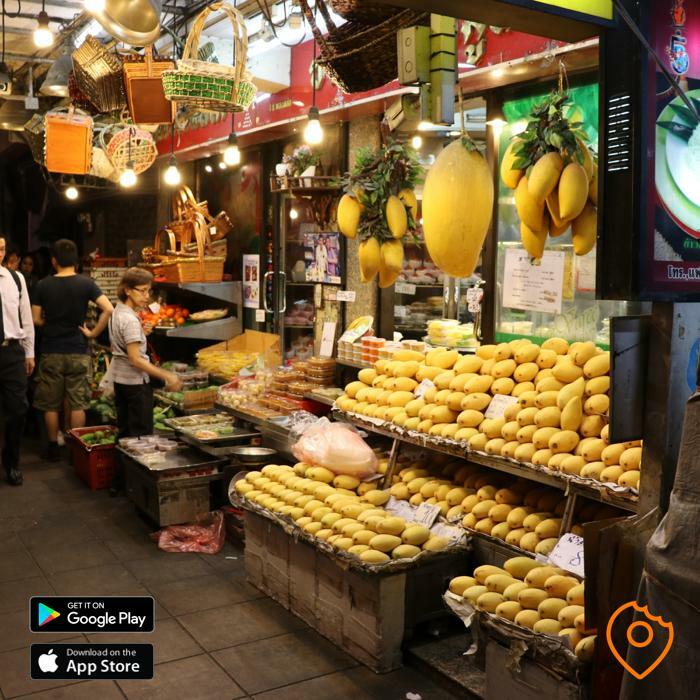 Bangkok’s most colourful mango sticky rice is located slightly out of town. Cho Sornkaew is known for its different flavours of sticky rice, derived from natural ingredients such as oranges, strawberries and blueberries. Cho Sornkaew imports its sticky rice from Chiang Rai and coconut cream for Prachuap Khiri Khan, which are famous regions for these ingredients. Although we didn’t find the flavours particularly strong and the sticky rice and coconut cream were rather salty, kids will love this dish. 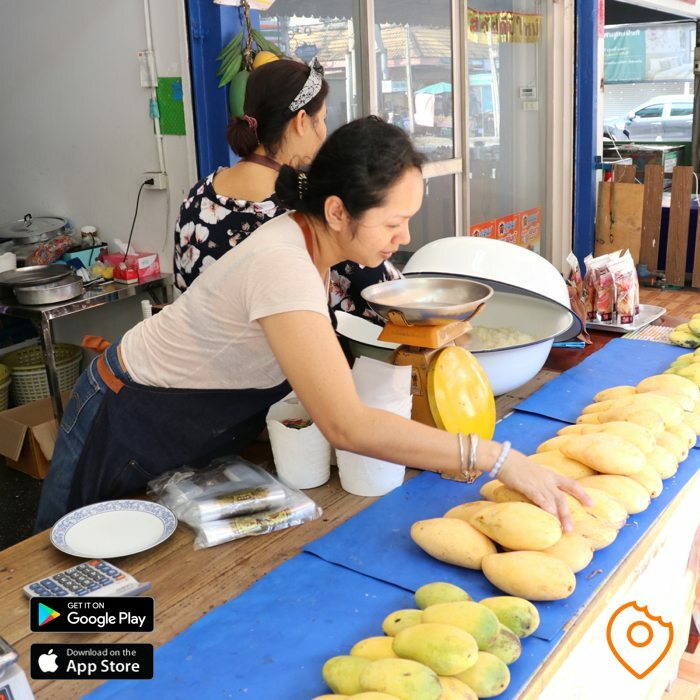 Cho Sornkaew sells Nam Dok Mai and Okrong mangoes and you can choose between mango sticky rice with three colours (50 THB) and a larger serving with nine colours (100 THB). The restaurant also prepares this coloured sticky rice with durian and jackfruit and even exports its famous desserts to Europe. 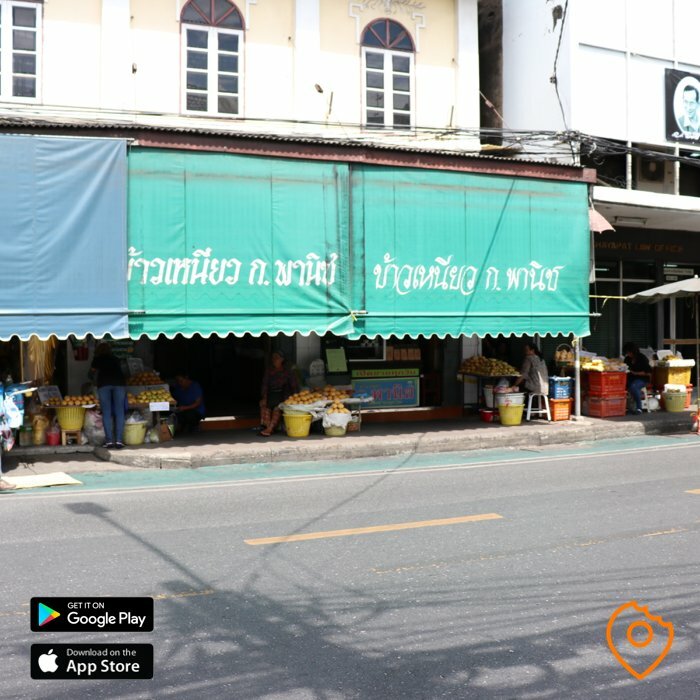 This is Bangkok’s most famous mango sticky rice restaurant, we believe because of their prime Thonglor location and the fact that they used to be open 24/7. We wanted to like Mae Varee so much. However, after trying it five times (both in and out of mango season) we don’t understand what all the fuss is about. To us, the dish is average at best, and on our last visit, the mango was particularly bad quality. Mae Varee is also the only restaurant on this list that makes their mango sticky rice boxes in advance. For the 160 THB they charge (the most expensive on this list), we expect a bit of service and fresh ingredients from “Bangkok’s best mango sticky rice” vendor. We guess prices have gone up and quality downhill due to their fame and fortune. Overall, you’re better of trying any of the other recommendations on this mango sticky rice in Bangkok list. If you’re looking for a restaurant in the Thonglor area, then we recommend Je Meaw, which is better quality, cheaper and just a stone’s throw from Mae Varee. 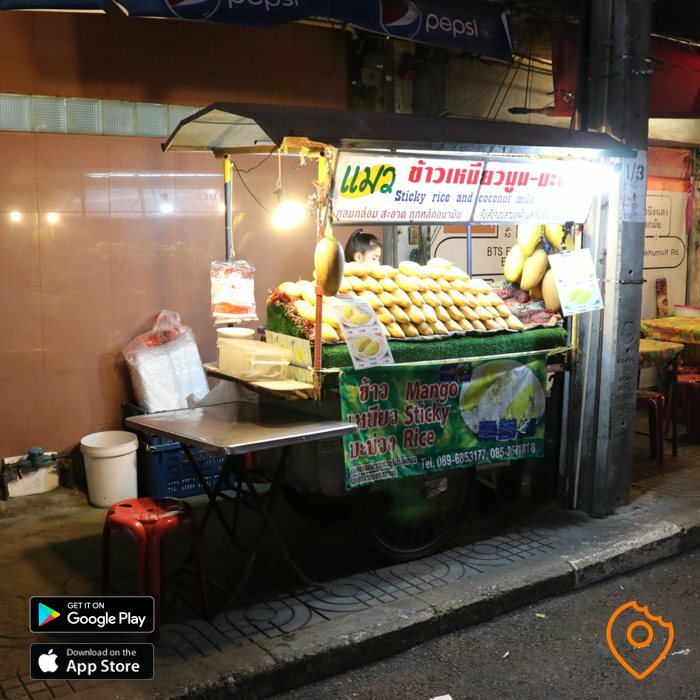 Please let us know what you think of these mango sticky rice vendors in Bangkok and download our TopTravelFoods app to rate and review Bangkok restaurants.